You should have noticed that the surfaces of these other worlds are covered with lots of different features. 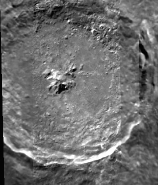 Some of the features, like impact craters, can be found on many worlds. Many features may be less common. Knowing what some of these features are when you look at images of other worlds can be exciting. This activity is designed to help you discover what some of those features are. First, look at the images on the LANDFORMS page. There are images of eleven kinds of landforms on this page, two of each kind (22 total). First, try to match the two of each kind together. There are eleven matching pairs. Once you have determined what they are, put your answer in the table below. Then, decide which images fit the descriptions below. You can print these out to work with easier, or you can do this activity by looking at the images on your monitor. If you print these images, you can cut out the cards and move them around to help match them. Try playing a "Landform Concentration" card game once you have identified each feature. Check your work by looking at the ANSWER KEY.